SHYC specializes in personalized bareboat training for our charter clients. We realize most of our charter clients have changing needs and goals regarding the size and type of yacht they wish to charter. Many of our guests are moving up from single engine lake boats wishing to understand the skills needed to operate twin engine Motor Yachts. While other guests are very fluent in their sailing skills but have decided they are ready to move sideways into the roomy Power Boats. The previous boating skills these boaters have in common may include water safety classes, basic navigation, tides and currents fundamentals and an understanding of boat mechanics and maintenance. We receive daily requests from clients, like those mentioned above, asking how they can further their yachting skills to qualify for chartering a specific boat they have found in our fleet. After an extensive interview with one of our training staff, we can determine the best approach for their specific training to allow the charterer and guests to bareboat their chosen yacht. We also consult with those individuals who have limited boating skills wanting to know the best way to move foreword in their education. Most often we recommend the Power Squadron courses or the Coast Guard Auxiliary coarses to learn boating safety and navigation fundamentals. After this groundwork has been established, a day or two of boat specific training gives most charters the capability needed to Bareboat the Yacht of their choice. We offer two methods of Bareboat training exclusively for our charter skippers and their crew. The first, most popular training we offer is the Early Start Program and the second more functional is our Supplemental Charter Training. 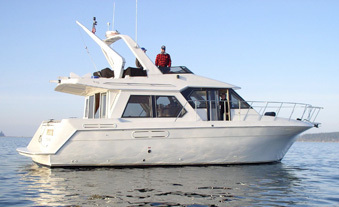 One of our Coast Guard licensed skippers will join the yacht charter group the first day of their week long cruise. Once all the gear is stowed, the training skipper will give a short safety briefing. The design of this training is to leave the dock early heading for the charter's first overnight destination. The entire day is structured to provide Skipper and Crew on-the-water training including review of the yacht's inventory, complete systems' orientation, in-route navigation, course charting, anchoring and mooring. Emergency procedures, safety standards and man overboard drills are practiced. Upon arrival at the end of the first day, the charter skipper and training skipper will review the day's activities and jointly decide if further training is needed. Ninety nine percent of the time the Training skipper will take the next ferry passage back to Anacortes and bid the charter group goodbye and a good week ahead. The advantage to this on-the-water training program is there are no additional boat use fees. The skipper's fee for the additional training is $250/day. See essential skills for more information. Check-outs are a four -part process and usually take between three to four hours. First, the charter group will review and identify a two page Ship's Inventory aboard the boat (usually 1 hour), second, they will check the Hull Condition Report (usually 15 minutes), third, a SHYC representative will review all Ship's Systems with the charter skipper (usually 1.5 hours), and fourth, the skipper and crew will Seatrial the boat with the SHYC representative ( Usually 1 hour). During this Seatrial extra time may be needed to accomplish proficiency. Our charters often need an extra hour or two of training, in addition to the normal check out time for their charter, to bring them current on the specific boat they are chartering. At this time our check out skipper will work with the captain and crew on close quarter maneuvers so the charter group is ready to meet the greater needs of their chosen charter boat. Any extra time needed for training beyond the normal check out time, specifically working on boat maneuvering skills, will be charged at $35/hr. SHYC can recommend captains and crew to help our charter guests either with extended training or full yacht management.